There was a greater incidence of myocardial infarction in alvimopan-treated patients compared to placebo-treated patients in a 12-month clinical trial, although a causal relationship has not been established. In short-term trials with ENTEREG®, no increased risk of myocardial infarction was observed [see Warnings and Precautions (5.1)]. Because of the potential risk of myocardial infarction with long-term use, ENTEREG is available only through a restricted program for short-term use (15 doses) under a Risk Evaluation and Mitigation Strategy (REMS) called the ENTEREG Access Support and Education (E.A.S.E.®) Program [see Warnings and Precautions (5.1) and (5.2)]. These highlights do not include all the information needed to use ENTEREG safely and effectively. See full prescribing information for ENTEREG. For hospital use only. The recommended adult dosage of ENTEREG is 12 mg administered 30 minutes to 5 hours prior to surgery followed by 12 mg twice daily beginning the day after surgery until discharge for a maximum of 7 days. Patients should not receive more than 15 doses of ENTEREG. 12 mg blue, hard-gelatin capsules with "ADL2698" printed on both the body and the cap of the capsule. ENTEREG is contraindicated in patients who have taken therapeutic doses of opioids for more than 7 consecutive days immediately prior to taking ENTEREG [see Warnings and Precautions (5.3)]. There were more reports of myocardial infarctions in patients treated with alvimopan 0.5 mg twice daily compared with placebo-treated patients in a 12-month study of patients treated with opioids for chronic non-cancer pain (alvimopan 0.5 mg, n = 538; placebo, n = 267). In this study, the majority of myocardial infarctions occurred between 1 and 4 months after initiation of treatment. This imbalance has not been observed in other studies of ENTEREG in patients treated with opioids for chronic pain, nor in patients treated within the surgical setting, including patients undergoing surgeries that included bowel resection who received ENTEREG 12 mg twice daily for up to 7 days (the indicated dose and patient population; ENTEREG 12 mg, n = 1,142; placebo, n = 1,120). A causal relationship with alvimopan with long-term use has not been established. ENTEREG is available only through a program under a REMS that restricts use to enrolled hospitals [see Warnings and Precautions (5.2)]. ENTEREG is available only through a program called the ENTEREG Access Support and Education (E.A.S.E.) ENTEREG REMS Program that restricts use to enrolled hospitals because of the potential risk of myocardial infarction with long-term use of ENTEREG [see Warnings and Precautions (5.1)]. ENTEREG is available only for short-term (15 doses) use in hospitalized patients. Only hospitals that have enrolled in and met all of the requirements for the E.A.S.E. program may use ENTEREG. ENTEREG will not be dispensed to patients after they have been discharged from the hospital. Further information is available at www.ENTEREGREMS.com or 1-800-278-0340. Patients recently exposed to opioids are expected to be more sensitive to the effects of Î¼-opioid receptor antagonists, such as ENTEREG. Since ENTEREG acts peripherally, clinical signs and symptoms of increased sensitivity would be related to the gastrointestinal tract (e.g., abdominal pain, nausea and vomiting, diarrhea). Patients receiving more than 3 doses of an opioid within the week prior to surgery were not studied in the postoperative ileus clinical trials. Therefore, if ENTEREG is administered to these patients, they should be monitored for gastrointestinal adverse reactions. ENTEREG is contraindicated in patients who have taken therapeutic doses of opioids for more than 7 consecutive days immediately prior to taking ENTEREG. Patients with severe hepatic impairment may be at higher risk of serious adverse reactions (including dose-related serious adverse reactions) because up to 10-fold higher plasma levels of drug have been observed in such patients compared with patients with normal hepatic function. Therefore, the use of ENTEREG is not recommended in this population. No studies have been conducted in patients with end-stage renal disease. ENTEREG is not recommended for use in these patients. No studies have been conducted in patients with complete gastrointestinal obstruction or in patients who have surgery for correction of complete bowel obstruction. ENTEREG is not recommended for use in these patients. ENTEREG has not been studied in patients having pancreatic or gastric anastomosis. Therefore, ENTEREG is not recommended for use in these patients. Because clinical trials are conducted under widely varying conditions, adverse reaction rates observed in the clinical trials of a drug cannot be compared directly with rates in the clinical trials of another drug and may not reflect the rates observed in clinical practice. The adverse event information from clinical trials does, however, provide a basis for identifying the adverse events that appear to be related to drug use and for approximating rates. The data described below reflect exposure to ENTEREG 12 mg in 1,793 patients in 10 placebo-controlled studies. The population was 19 to 97 years old, 64% were female, and 84% were Caucasian; 64% were undergoing a surgery that included bowel resection. The first dose of ENTEREG was administered 30 minutes to 5 hours before the scheduled start of surgery and then twice daily until hospital discharge (or for a maximum of 7 days of postoperative treatment). Among ENTEREG-treated patients undergoing surgeries that included a bowel resection, the most common adverse reaction (incidence â‰¥1.5%) occurring with a higher frequency than placebo was dyspepsia (ENTEREG, 1.5%; placebo, 0.8%). Adverse reactions are events that occurred after the first dose of study medication treatment and within 7 days of the last dose of study medication or events present at baseline that increased in severity after the start of study medication treatment. An in vitro study indicates that alvimopan is not a substrate of CYP enzymes. Therefore, concomitant administration of ENTEREG with inducers or inhibitors of CYP enzymes is unlikely to alter the metabolism of alvimopan. Based on in vitro data, ENTEREG is unlikely to alter the pharmacokinetics of coadministered drugs through inhibition of CYP isoforms such as 1A2, 2C9, 2C19, 3A4, 2D6, and 2E1 or induction of CYP isoforms such as 1A2, 2B6, 2C9, 2C19, and 3A4. In vitro, ENTEREG did not inhibit p-glycoprotein. A population pharmacokinetic analysis suggests that the pharmacokinetics of alvimopan were not affected by concomitant administration of acid blockers or antibiotics. No dosage adjustments are necessary in patients taking acid blockers or antibiotics. Risk Summary: There are no adequate and/or well-controlled studies with ENTEREG in pregnant women. No fetal harm was observed in animal reproduction studies with oral administration of alvimopan to rats at doses 68 to 136 times the recommended human oral dose, or with intravenous administration to rats and rabbits at doses 3.4 to 6.8 times, and 5 to 10 times, respectively, the recommended human oral dose. Because animal reproduction studies are not always predictive of human response, ENTEREG should be used during pregnancy only if clearly needed. Animal Data: Reproduction studies were performed in pregnant rats at oral doses up to 200 mg/kg/day (about 68 to 136 times the recommended human oral dose based on body surface area) and at intravenous doses up to 10 mg/kg/day (about 3.4 to 6.8 times the recommended human oral dose based on body surface area) and in pregnant rabbits at intravenous doses up to 15 mg/kg/day (about 5 to 10 times the recommended human oral dose based on body surface area), and revealed no evidence of impaired fertility or harm to the fetus due to alvimopan. It is not known whether ENTEREG is present in human milk. Alvimopan and its 'metabolite' are detected in the milk of lactating rats. Exercise caution when administering ENTEREG to a nursing woman [see Clinical Pharmacology (12.3)]. Of the total number of patients in 6 clinical efficacy studies treated with ENTEREG 12 mg or placebo, 46% were 65 years of age and over, while 18% were 75 years of age and over. No overall differences in safety or effectiveness were observed between these patients and younger patients, and other reported clinical experience has not identified differences in responses between the elderly and younger patients, but greater sensitivity of some older individuals cannot be ruled out. No dosage adjustment based on increased age is required [see Clinical Pharmacology (12.3)]. ENTEREG is not recommended for use in patients with severe hepatic impairment. Dosage adjustment is not required for patients with mild-to-moderate hepatic impairment. Patients with mild-to-moderate hepatic impairment should be closely monitored for possible adverse effects (e.g., diarrhea, gastrointestinal pain, cramping) that could indicate high drug or 'metabolite' levels, and ENTEREG should be discontinued if adverse events occur [see Warnings and Precautions (5.4) and Clinical Pharmacology (12.3)]. ENTEREG is not recommended for use in patients with end-stage renal disease. Dosage adjustment is not required for patients with mild-to-severe renal impairment, but they should be monitored for adverse effects. Patients with severe renal impairment should be closely monitored for possible adverse effects (e.g., diarrhea, gastrointestinal pain, cramping) that could indicate high drug or 'metabolite' levels, and ENTEREG should be discontinued if adverse events occur [see Clinical Pharmacology (12.3)]. No dosage adjustment is necessary in Black, Hispanic, and Japanese patients. However, the exposure to ENTEREG in Japanese healthy male volunteers was approximately 2-fold greater than in Caucasian subjects. Japanese patients should be closely monitored for possible adverse effects (e.g., diarrhea, gastrointestinal pain, cramping) that could indicate high drug or 'metabolite' levels, and ENTEREG should be discontinued if adverse events occur [see Clinical Pharmacology (12.3)]. Alvimopan is a white to light beige powder with a molecular weight of 460.6, and the empirical formula is C25H32N2O4âˆ™2H2O. It has a solubility of <0.1 mg/mL in water or buffered solutions between pH 3.0 and 9.0, 1 to 5 mg/mL in buffered solutions at pH 1.2, and 10 to 25 mg/mL in aqueous 0.1 N sodium hydroxide. At physiological pH, alvimopan is zwitterionic, a property that contributes to its low solubility. Alvimopan is a selective antagonist of the cloned human Î¼-opioid receptor with a Ki of 0.4 nM (0.2 ng/mL) and no measurable opioid-agonist effects in standard pharmacologic assays. The dissociation of [3H]-alvimopan from the human Î¼-opioid receptor is slower than that of other opioid ligands, consistent with its higher affinity for the receptor. At concentrations of 1 to 10 µM, alvimopan demonstrated no activity at any of over 70 non-opioid receptors, enzymes, and ion channels. Postoperative ileus is the impairment of gastrointestinal motility after intra-abdominal surgery or other, non-abdominal surgeries. Postoperative ileus affects all segments of the gastrointestinal tract and may last from 5 to 6 days, or even longer. This may potentially delay gastrointestinal recovery and hospital discharge until its resolution. It is characterized by abdominal distention and bloating, nausea, vomiting, pain, accumulation of gas and fluids in the bowel, and delayed passage of flatus and defecation. Postoperative ileus is the result of a multifactorial process that includes inhibitory sympathetic input and release of hormones, neurotransmitters, and other mediators (e.g., endogenous opioids). A component of postoperative ileus also results from an inflammatory reaction and the effects of opioid analgesics. Morphine and other Î¼-opioid receptor agonists are universally used for the treatment of acute postsurgical pain; however, they are known to have an inhibitory effect on gastrointestinal motility and may prolong the duration of postoperative ileus. Following oral administration, alvimopan antagonizes the peripheral effects of opioids on gastrointestinal motility and secretion by competitively binding to gastrointestinal tract Î¼-opioid receptors. The antagonism produced by alvimopan at opioid receptors is evident in isolated guinea pig ileum preparations in which alvimopan competitively antagonizes the effects of morphine on contractility. Alvimopan achieves this selective gastrointestinal opioid antagonism without reversing the central analgesic effects of Î¼-opioid agonists. In an exploratory study in healthy volunteers, alvimopan 12 mg administered twice a day reduced the delay in small and large bowel transit induced by codeine 30 mg administered 4 times a day, as measured by gastrointestinal scintigraphy. In the same study, concomitant alvimopan did not reduce the delay in gastric emptying induced by codeine. In a study designed to evaluate potential effects on cardiac conduction, alvimopan did not cause clinically significant QTc prolongation at doses up to 24 mg twice daily (twice the approved dosage regimen) for 7 days. The potential for QTc effects at higher doses has not been studied. Following oral administration of alvimopan, an amide hydrolysis compound is present in the systemic circulation, which is considered a product exclusively of intestinal flora metabolism. This compound is referred to as the 'metabolite'. It is also a Î¼-opioid receptor antagonist with a Ki of 0.8 nM (0.3 ng/mL). Absorption: Following oral administration of ENTEREG capsules in healthy volunteers, plasma alvimopan concentration peaked at approximately 2 hours postdose. No significant accumulation in alvimopan concentration was observed following twice daily (BID) dosing. The mean peak plasma concentration was 10.98 (±6.43) ng/mL and mean AUC0â€“12h was 40.2 (±22.5) ngâˆ™h/mL after dosing of alvimopan at 12 mg BID for 5 days. The absolute bioavailability was estimated to be 6% (range, 1% to 19%). There was a delay in the appearance of the 'metabolite', which had a median Tmax of 36 hours following administration of a single dose of alvimopan. Concentrations of the 'metabolite' were highly variable between subjects and within a subject. The 'metabolite' accumulated after multiple doses of ENTEREG. The mean Cmax for the 'metabolite' after alvimopan 12 mg twice daily for 5 days was 35.73 ± 35.29 ng/mL. Concentrations of alvimopan and its 'metabolite' are higher (~1.9-fold and ~1.4-fold, respectively) in postoperative ileus patients than in healthy volunteers. Food Effects: A high-fat meal decreased the extent and rate of alvimopan absorption. The Cmax and AUC were decreased by approximately 38% and 21%, respectively, and the Tmax was prolonged by approximately 1 hour. The clinical significance of this decreased bioavailability is unknown. In postoperative ileus clinical trials, the preoperative dose of ENTEREG was administered in a fasting state. Subsequent doses were given without regard to meals. Distribution: The steady-state volume of distribution of alvimopan was estimated to be 30±10 L. Plasma protein binding of alvimopan and its 'metabolite' was independent of concentration over ranges observed clinically and averaged 80% and 94%, respectively. Both alvimopan and the 'metabolite' were bound to albumin and not to alpha-1 acid glycoprotein. Metabolism and Elimination: In vitro data suggest that alvimopan is not a substrate of CYP enzymes. The average plasma clearance for alvimopan was 402 (±89) mL/min. Renal excretion accounted for approximately 35% of total clearance. There was no evidence that hepatic metabolism was a significant route for alvimopan elimination. Biliary secretion was considered the primary pathway for alvimopan elimination. Unabsorbed drug and unchanged alvimopan resulting from biliary excretion were then hydrolyzed to its 'metabolite' by gut microflora. The 'metabolite' was eliminated in the feces and in the urine as unchanged 'metabolite', the glucuronide conjugate of the 'metabolite', and other minor metabolites. The mean terminal phase half-life of alvimopan after multiple oral doses of ENTEREG ranged from 10 to 17 hours. The terminal half-life of the 'metabolite' ranged from 10 to 18 hours. Age: The pharmacokinetics of alvimopan, but not its 'metabolite', were related to age, but this effect was not clinically significant and does not warrant dosage adjustment based on increased age. Race: The pharmacokinetic characteristics of alvimopan were not affected by Hispanic or Black race. Plasma 'metabolite' concentrations were lower in Black and Hispanic patients (by 43% and 82%, respectively) than in Caucasian patients following alvimopan administration. These changes are not considered to be clinically significant in surgical patients. Japanese healthy male volunteers had an approximately 2-fold increase in plasma alvimopan concentrations, but no change in 'metabolite' pharmacokinetics. The pharmacokinetics of alvimopan have not been studied in subjects of other East Asian ancestry. Dosage adjustment in Japanese patients is not required [see Use in Specific Populations (8.8)]. Gender: There was no effect of gender on the pharmacokinetics of alvimopan or the 'metabolite'. Hepatic Impairment: Exposure to alvimopan following a single 12 mg dose tended to be higher (1.5- to 2-fold, on average) in patients with mild or moderate hepatic impairment (as defined by Child-Pugh Class A and B, n = 8 each) compared with healthy controls (n = 4). There were no consistent effects on the Cmax or half-life of alvimopan in patients with hepatic impairment. However, 2 of 16 patients with mild-to-moderate hepatic impairment had longer than expected half-lives of alvimopan, indicating that some accumulation may occur upon multiple dosing. The Cmax of the 'metabolite' tended to be more variable in patients with mild or moderate hepatic impairment than in matched normal subjects. A study of 3 patients with severe hepatic impairment (Child-Pugh Class C), indicated similar alvimopan exposure in 2 patients and an approximately 10-fold increase in Cmax and exposure in 1 patient with severe hepatic impairment when compared with healthy control volunteers [see Warnings and Precautions (5.4) and Use in Specific Populations (8.6)]. Renal Impairment: There was no relationship between renal function (i.e., creatinine clearance [CrCl]) and plasma alvimopan pharmacokinetics (Cmax, AUC, or half-life) in patients with mild (CrCl 51â€“80 mL/min), moderate (CrCl 31â€“50 mL/min), or severe (CrCl <30 mL/min) renal impairment (n = 6 each). Renal clearance of alvimopan was related to renal function; however, because renal clearance was only a small fraction (35%) of the total clearance, renal impairment had a small effect on the apparent oral clearance of alvimopan. The half-lives of alvimopan were comparable in the mild, moderate, and control renal impairment groups but longer in the severe renal impairment group. Exposure to the 'metabolite' tended to be 2- to 5-fold higher in patients with moderate or severe renal impairment compared with patients with mild renal impairment or control subjects. Thus, there may be accumulation of alvimopan and 'metabolite' in patients with severe renal impairment receiving multiple doses of ENTEREG. Patients with end-stage renal disease were not studied [see Warnings and Precautions (5.5) and Use in Specific Populations (8.7)]. Crohn's Disease: There was no relationship between disease activity in patients with Crohn's disease (measured as Crohn's Disease Activity Index or bowel movement frequency) and alvimopan pharmacokinetics (AUC or Cmax). Patients with active or quiescent Crohn's disease had increased variability in alvimopan pharmacokinetics, and exposure tended to be 2-fold higher in patients with quiescent disease than in those with active disease or in normal subjects. Concentrations of the 'metabolite' were lower in patients with Crohn's disease. Potential for Drugs to Affect Alvimopan Pharmacokinetics: Concomitant administration of ENTEREG with inducers or inhibitors of CYP enzymes is unlikely to alter the metabolism of alvimopan because ENTEREG is metabolized mainly by non-CYP enzyme pathway. No clinical studies have been performed to assess the effect of concomitant administration of inducers or inhibitors of cytochrome P450 enzymes on alvimopan pharmacokinetics. In vitro studies suggest that alvimopan and its 'metabolite' are substrates for p-glycoprotein. A population pharmacokinetic analysis did not reveal any evidence that alvimopan or 'metabolite' pharmacokinetics were influenced by concomitant medications that are mild-to-moderate p-glycoprotein inhibitors. No clinical studies of concomitant administration of alvimopan and strong inhibitors of p-glycoprotein (e.g., verapamil, cyclosporine, amiodarone, itraconazole, quinine, spironolactone, quinidine, diltiazem, bepridil) have been conducted. A population pharmacokinetic analysis suggests that the pharmacokinetics of alvimopan were not affected by concomitant administration of acid blockers or antibiotics. However, plasma concentrations of the 'metabolite' were lower in patients receiving acid blockers or preoperative oral antibiotics (49% and 81%, respectively). No dosage adjustments are necessary in these patients. Potential for Alvimopan to Affect the Pharmacokinetics of Other Drugs: Alvimopan and its 'metabolite' are not inhibitors of CYP 1A2, 2C9, 2C19, 3A4, 2D6, and 2E1 in vitro at concentrations far in excess of those observed clinically. Alvimopan and its 'metabolite' are not inducers of CYP 1A2, 2B6, 2C9, 2C19, and 3A4. In vitro studies also suggest that alvimopan and its 'metabolite' are not inhibitors of p-glycoprotein. These in vitro findings suggest that ENTEREG is unlikely to alter the pharmacokinetics of coadministered drugs through inhibition or induction of CYP enzymes or inhibition of p-glycoprotein. Carcinogenesis: Two-year carcinogenicity studies were conducted with alvimopan in CD-1 mice at oral doses up to 4000 mg/kg/day and in Sprague Dawley® rats at oral doses up to 500 mg/kg/day. Oral administration of alvimopan for 104 weeks produced significant increases in the incidences of fibroma, fibrosarcoma, and sarcoma in the skin/subcutis, and of osteoma/osteosarcoma in bones of female mice at 4000 mg/kg/day (about 674 times the recommended human dose based on body surface area). In rats, oral administration of alvimopan for 104 weeks did not produce any tumor up to 500 mg/kg/day (about 166 times the recommended human dose based on body surface area). Mutagenesis: Alvimopan was not genotoxic in the Ames test, the mouse lymphoma cell (L5178Y/TK+/âˆ’) forward mutation test, the Chinese Hamster Ovary (CHO) cell chromosome aberration test, or the mouse micronucleus test. The pharmacologically active 'metabolite' ADL 08-0011 was negative in the Ames test, chromosome aberration test in CHO cells, and mouse micronucleus test. Impairment of Fertility: Alvimopan at intravenous doses up to 10 mg/kg/day (about 3.4 to 6.8 times the recommended human oral dose based on body surface area) was found to have no adverse effect on fertility and reproductive performance of male or female rats. The efficacy of ENTEREG in the management of postoperative ileus was evaluated in 6 multicenter, randomized, double-blind, parallel-group, placebo-controlled studies: 5 US studies (Studies 1-4 and 6) and 1 nonâ€“US study (Study 5). Patients 18 years of age or older undergoing partial large or small bowel resection surgery with primary anastomosis for colorectal or small bowel disease, total abdominal hysterectomy, or radical cystectomy for bladder cancer (in this procedure, resected segments of bowel are used for reconstruction of the urinary tract) under general anesthesia were randomly assigned to receive oral doses of ENTEREG 12 mg or matching placebo. The initial dose was administered at least 30 minutes and up to 5 hours prior to the scheduled start of surgery for most patients, and subsequent doses were administered twice daily beginning on the first postoperative day and continued until hospital discharge or a maximum of 7 days. There were no limitations on the type of general anesthesia used, but intrathecal or epidural opioids or anesthetics were prohibited. All patients in the US studies were scheduled to receive intravenous patient-controlled opioid analgesia. In the nonâ€“US study, patients were scheduled to receive opioids either by intravenous patient-controlled opioid analgesia or bolus parenteral administration (intravenous or intramuscular). In all studies, there was no restriction on the type of opioid used or the duration of intravenous patient-controlled opioid analgesia. 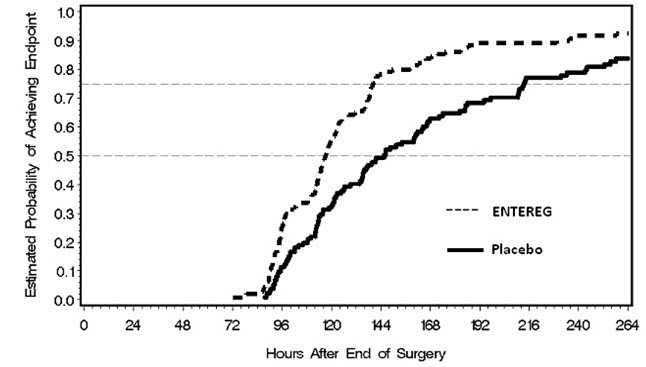 A standardized accelerated postoperative care pathway was implemented: early nasogastric tube removal (before the first postoperative dose); early ambulation (day following surgery); early diet advancement (liquids offered the day following surgery for patients undergoing bowel resection and by the third day following surgery for patients undergoing radical cystectomy; solids by the second day following surgery for patients undergoing bowel resection and by the fourth day following surgery for patients undergoing radical cystectomy), as tolerated. The primary endpoint for all studies was time to achieve resolution of postoperative ileus, a clinically defined composite measure of both upper and lower gastrointestinal recovery. Although both 2-component (GI2: toleration of solid food and first bowel movement) and 3-component (GI3: toleration of solid food and either first flatus or bowel movement) endpoints were used in all studies, GI2 is presented as it represents the most objective and clinically relevant measure of treatment response in patients undergoing surgeries that include a bowel resection. 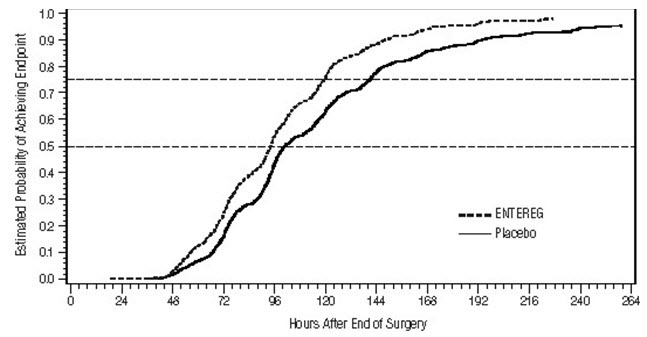 The time from the end of surgery to when the discharge order was written represented the length of hospital stay. In the 6 studies, 1,058 patients who underwent a surgery that included a bowel resection received placebo (not including 157 for total abdominal hysterectomy) and 1,096 patients received ENTEREG 12 mg (not including 143 for total abdominal hysterectomy). The efficacy of ENTEREG following total abdominal hysterectomy has not been established. Therefore, the following data are presented only for surgeries that included a bowel resection (i.e., bowel resection or radical cystectomy). Bowel Resection or Radical Cystectomy: A total of 2,154 patients underwent a surgery that included a bowel resection. The average age was 62 years, 54% were males, and 89% were Caucasian. The most common indications for surgery were colon or rectal cancer/malignancy, bladder cancer, and diverticular disease. In the nonâ€“US bowel resection study (Study 5), average daily postoperative opioid consumption was approximately 50% lower and the use of non-opioid analgesics substantially higher, as compared with the US bowel resection studies (Studies 1-4) for both treatment groups. During the first 48 hours postoperatively, the use of non-opioid analgesics was 69% compared with 4% for the nonâ€“US and US bowel resection studies, respectively. In each of the 6 studies, ENTEREG accelerated the time to recovery of gastrointestinal function, as measured by the composite endpoint GI2, and time to discharge order written as compared with placebo. Hazard ratios greater than 1 indicate a higher probability of achieving the event during the study period with treatment with ENTEREG than with placebo. Table 1 provides the Hazard Ratios, Kaplan Meier means, medians, and mean and median treatment differences (hours) in gastrointestinal recovery between ENTEREG and placebo. • The estimates of the means and differences of treatment means are biased because of the censoring of events not achieved prior to the end of the observation period (10 days). The estimates of the differences of treatment means are likely to be underestimates. The Kaplan Meier estimate probabilities of patients receiving ENTEREG who achieved GI2 were numerically higher at all times throughout the study observation period compared with those of patients receiving placebo (see Figures 1 and 2). In Studies 1â€“4, the differences between ENTEREG and placebo patient groups in median time to 'discharge order written' ranged from 6 to 22 hours, in favor of ENTEREG patients. The group differences in mean time to 'discharge order written' ranged from 13 to 21 hours. In Study 6, the median time difference was 19 hours in favor of ENTEREG patients (mean time difference 22 hours). ENTEREG did not reverse opioid analgesia as measured by visual analog scale pain intensity scores and/or amount of postoperative opioids administered across all 6 studies. The incidence of anastomotic leak was low and comparable in patients receiving either ENTEREG or placebo (0.7% and 1.0%, respectively). 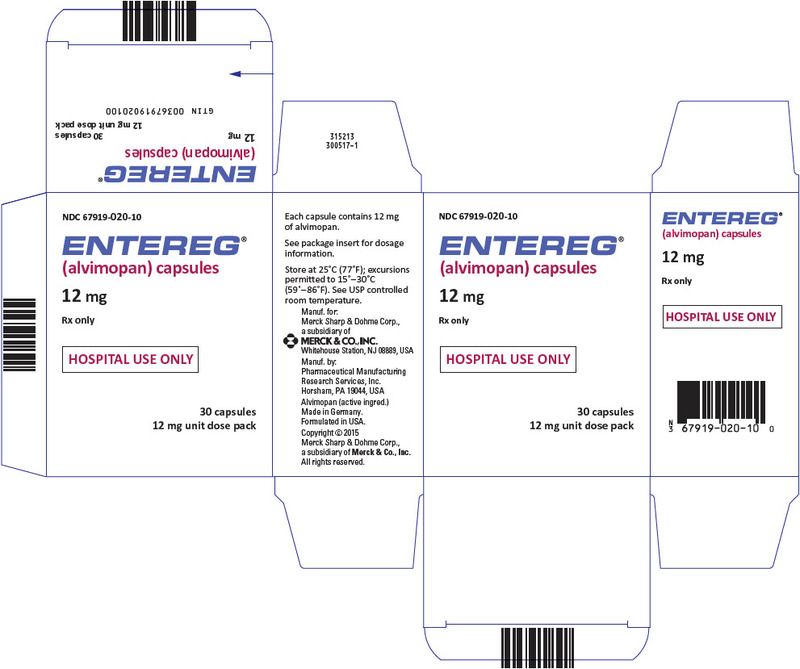 ENTEREG capsules, 12 mg, are blue, hard-gelatin capsules printed with "ADL2698" on both the body and the cap of the capsule. ENTEREG capsules are available in unit-dose packs of 30 capsules (30 doses) (NDC 67919-020-10) for hospital use only. Store at 25°C (77°F); excursions permitted to 15â€“30°C (59â€“86°F) [see USP Controlled Room Temperature]. ENTEREG is available only through a program called the ENTEREG Access Support and Education (E.A.S.E.) Program under a REMS that restricts use to enrolled hospitals because of the potential risk of myocardial infarction with long-term use of ENTEREG. Patients should be informed that ENTEREG is for hospital use only for no more than 7 days after their bowel resection surgery. Patients should be informed that the most common side effect with ENTEREG in patients undergoing surgeries that include bowel resection is dyspepsia. Copyright © 2015 Merck Sharp & Dohme Corp., a subsidiary of Merck & Co., Inc.